Creepshow is a 1982 American black comedy horror anthology film directed by George A. Romero and written by Stephen King, making this film his screenwriting debut. The film's ensemble cast includes Hal Holbrook, Adrienne Barbeau, Fritz Weaver, Leslie Nielsen, Ted Danson and E. G. Marshall, as well as King himself in his film acting debut. The film was shot on location in Pittsburgh and its suburbs, including Monroeville, where Romero leased an old boys academy (Penn Hall) to build extensive sets for the film. 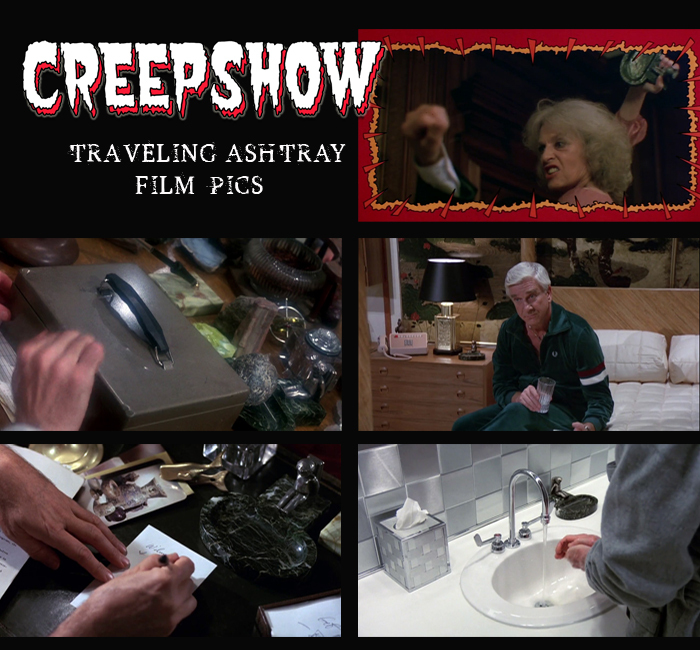 The ashtray is primarily featured in the film's first segment, "Father's Day," though it became what George describes as a "pet prop" which worked its way into all four of the other stories in Creepshow , including the "wraparound" story featuring young Billy, his crotchety Dad, and a handy voodoo doll. Dimensions : 5,51 in width (14 cm) aprox. Weight : 0,55 pounds / 250 gr aprox. Materials : Made of 2 pieces of polyurethane resin. Painting : Hand painted with high strength and durability paints to match the green marble and pewter from the film.